Our friend and frequent blog participant, Maria, suggested we review one of her favorite restaurants: Buddha Thai Bistro in Vacaville, Ca. After being bombarded with beautiful food shots on her Facebook account, we decided we couldn’t stand it anymore and needed to visit this place ourselves. Boy, are we glad we did! We arrived at this neighborhood restaurant, that is located in a strip mall parking lot. It didn’t look much from the outside, but I knew from all of Maria’s ravings this was going to be good. We met with the owner Andy Poosman before dinner and had a chance to talk with him over a Thai iced coffee and their signature mango nata non-alcoholic cocktail drink. He’s such a sweet man, and you can tell he’s loved by all of his customers. He started his own business after working for years managing a Thai restaurant in the nearby town of Vallejo. 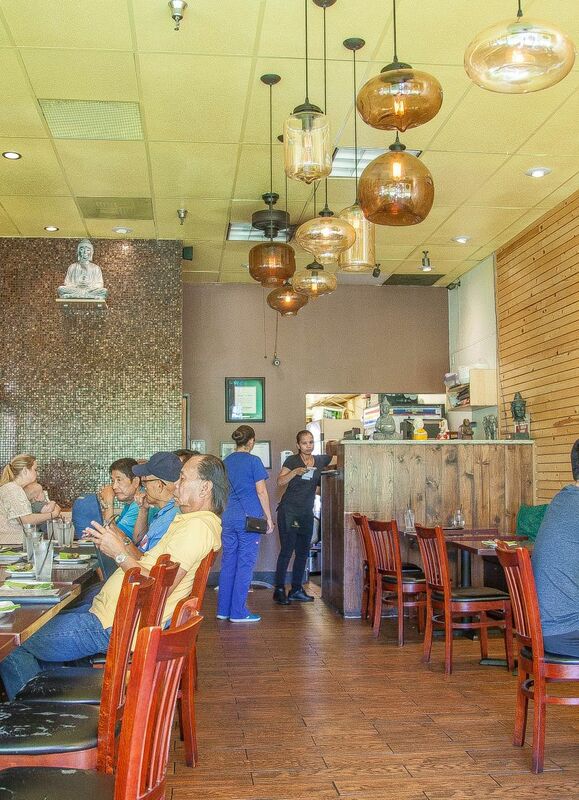 After opening Buddha Thai Bistro, Andy and his wife worked tirelessly, even sending their children back to Thailand to be cared for by their grandparents while they got their business up and running. His now growing family includes three beautiful little girls and they are enjoying their success. Yelp reviews placed it in the top twenty restaurants in the United States for 2015 and his little restaurant has been featured in several newspaper articles, food blogs, and on the TV program “Good Morning Sacramento”. From our experience, I think all of the praise is well earned. The interior of the restaurant is clean and modern. I liked the simple decor with the tile accent wall and the pretty bauble chandelier. It is what one would call Bijoux, but has a really nice vibe. Even on a Tuesday night, this place was full! I want to talk a minute about the drinks we enjoyed during our chat with Andy. I had a traditional Thai iced coffee and The Brit had something called a mango nata. My iced coffee was delicious; cool and rich without being sickly sweet. It came presweetened and it was sweeter than I prefer, but it wasn’t Starbucks level sweet; making my teeth ache. It also had a rich coffee flavor without being at all bitter. I give it a big thumbs up. The mango nata was interesting, and neither The Brit nor I had ever had anything like it before. I would describe it as a refreshing, lightly sweet mango flavored soda. It was a nice palate cleanser before starting the meal. We really enjoyed it. The Brit comments: The mango soda was light and not overly sweet. I like mango, but it can be cloying. Here, it was a delightful cleanser that worked well with the richly flavoured food. I also would like to note that the house wine was surprisingly good. We had a glass of their Sauvignon Blanc, which was crisp and with enough heft to work with spicy food. Our meal started with an order of fresh vegetarian Spring rolls. This was served with their signature satay and sweet chili sauces. It was a very large order, and as advertised it was very fresh and light tasting. 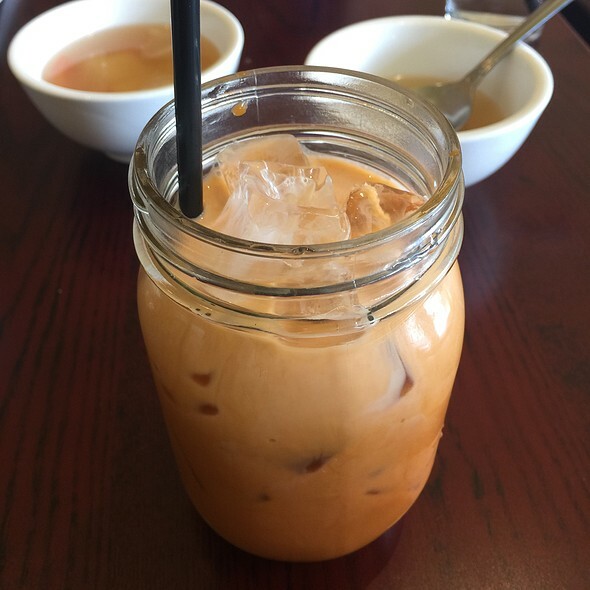 We were really impressed with the flavor of the satay sauce, with its amazing peanut flavor and vowed to try the chicken satay on our next visit. Our next dish was the citrus chicken fried rice. Andy told us with a smile that if you don’t order this in his restaurant you are just wrong. It is a customer favorite dish, and he’s very proud of it. 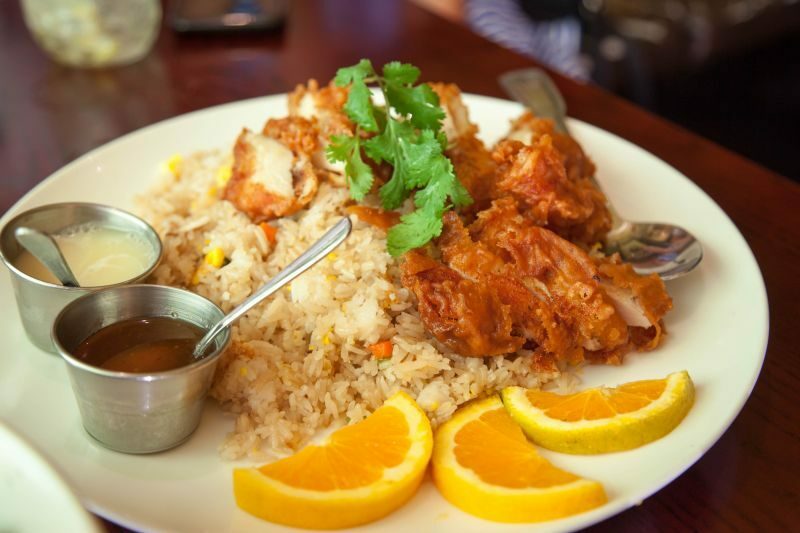 It consists of lightly battered, perfectly cooked chicken over a bed of fried rice. There is a creamy citrus sauce and a sweet and sour sauce that is served on the side so you can add as much or as little as you would like. Did you hear me say PERFECTLY COOKED CHICKEN? Yeh, I know, it’s unusual for me to say, but the chicken had a beautiful, light, crispy batter on the outside, yet was tender and juicy on the inside. The creamy citrus sauce gave it a little brightness and a hint of sweet and creamy which gave it that extra over the top yumm. Having said all of that, it was the fried rice that was served with it that really had my taste buds excited. We have all had fried rice that is well, bland and uninspiring. I usually just stick to white rice or noodles because it doesn’t have enough interest to warrant the extra calories. This one, however, was the exception and was packed with flavor. It tasted like the rice had been flavored with stock before it was fried. We would highly recommend this dish especially to those of you who don’t like spicy food. The Brit comments: I agree; the rice would have been a delightful dish all on its own. Our next dish was the mango curried shrimp; a beautiful presentation with gorgeous colors. 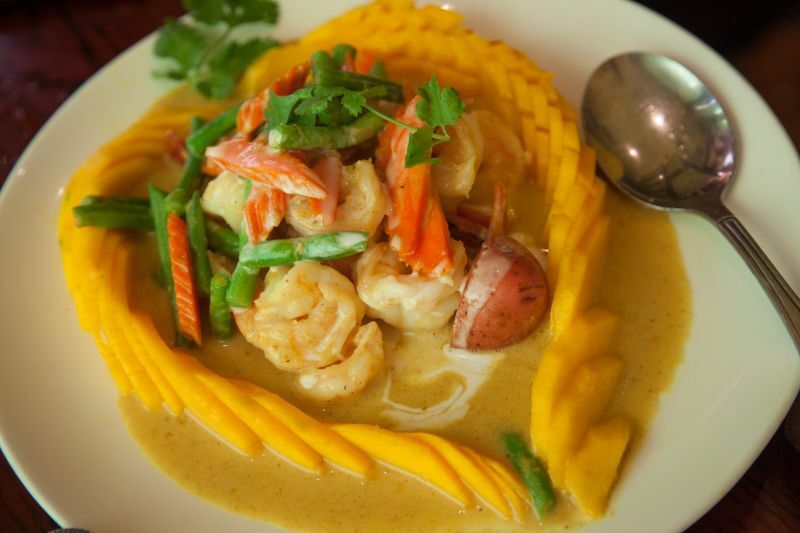 The yellow lemongrass curry blended beautifully with the mango flavor and the plentiful shrimp gave the dish real weight and meaty goodness. I was truly impressed by the quantity of the shrimp in the dish, and the quality of the cook of the dish. The shrimp were perfectly tender and were visually appealing. I thought this had just enough spice to make it interesting and not to overwhelm the rest of the flavors. The Brit comments: This was my favourite dish of the evening. It looked stunning, with vibrant colours. The balance of flavours and textures was just as striking. Our last dish was what Andy called the salmon healthy bowl. This was the most unusual dish we ate and it was delicious! It was kind of the Thai food equivalent of a Mexican burrito bowl. Cooked marinated salmon on top of spiced brown rice with dried cranberries, avocado slices, spring onions, bean sprouts, and a whole lot of yumm factor. The combination of flavors was really inspired. It had that whole sweet and savory thing going on with many earthy flavors to pull it all together. For me, the salmon was a bit overcooked, but I don’t know if that was just the cook that night, or if it is the traditional way to prepare the dish. Still, it wasn’t to the point that I didn’t enjoy what I was eating. By this time we were so full we could hardly move but it didn’t stop there. We were treated to a dessert of deep fried bananas with vanilla ice cream and chocolate syrup. It was the perfect small portion to round out our meal. Delicious! 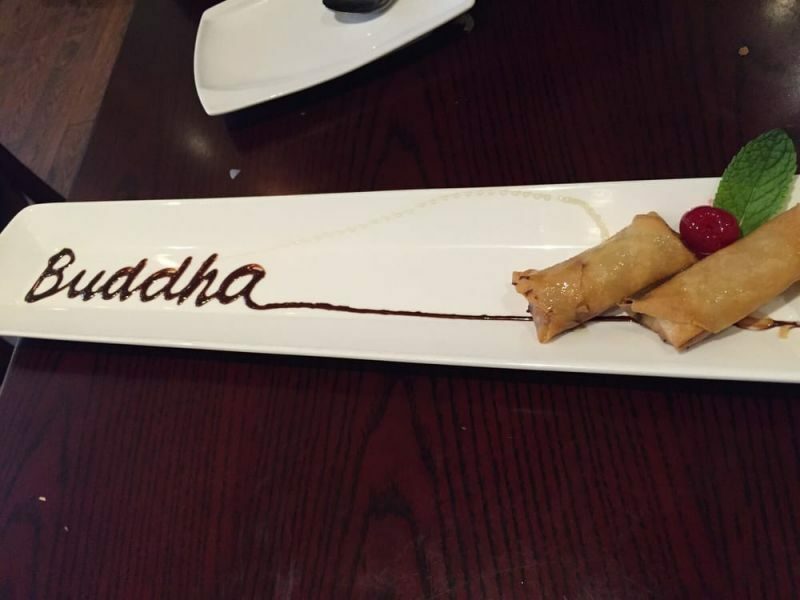 I really liked they way the chef spelled out Buddha on the plate in chocolate syrup. The staff was friendly and solicitous, though, I have to say that they were expecting us on this occasion. Since our friend Maria is a frequent visitor I would have to guess that the gracious hospitality we received is the norm. They sadly don’t take reservations and the place is very small and busy, so maybe ordering take out would be best if you can’t wait. The quality of the food, however, is worth it if you do find yourself having to wait for a table. 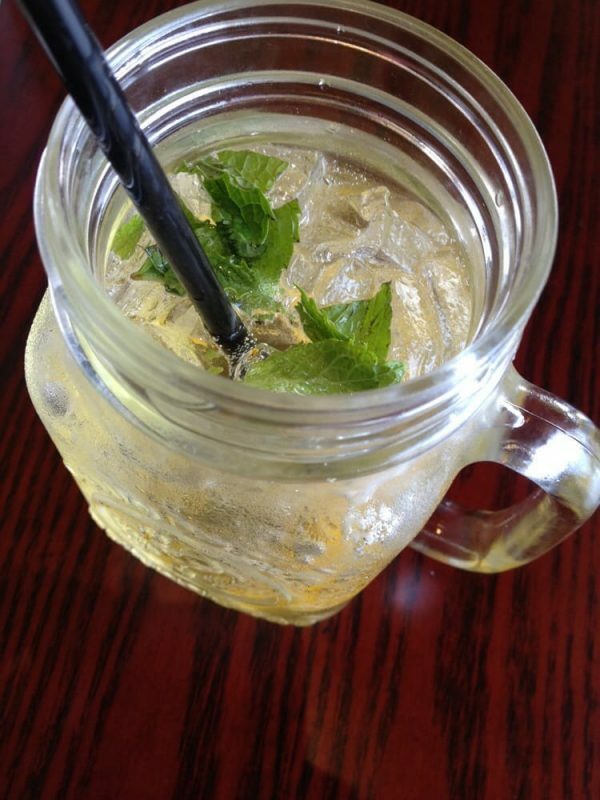 We absolutely loved Buddha Thai Bistro and would recommend that you visit when you are in the mood for Thai cuisine. 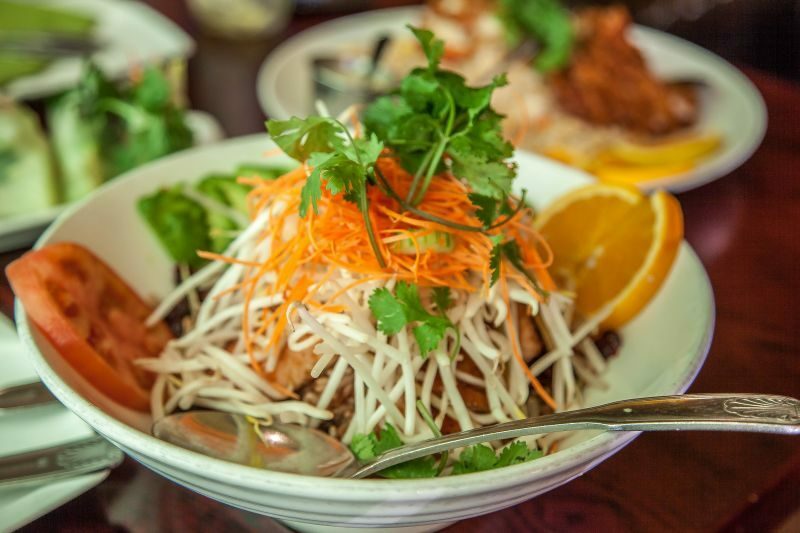 It is a great family owned neighborhood place that is comfortable, casual and delicious. We will be adding this to our list of favorites in the Vacaville area. The Brit comments: I would also recommend this place even if you are not in the mood for Thai food. The dishes were tried were markedly different from what I have experienced in other Thai restaurants in the US. 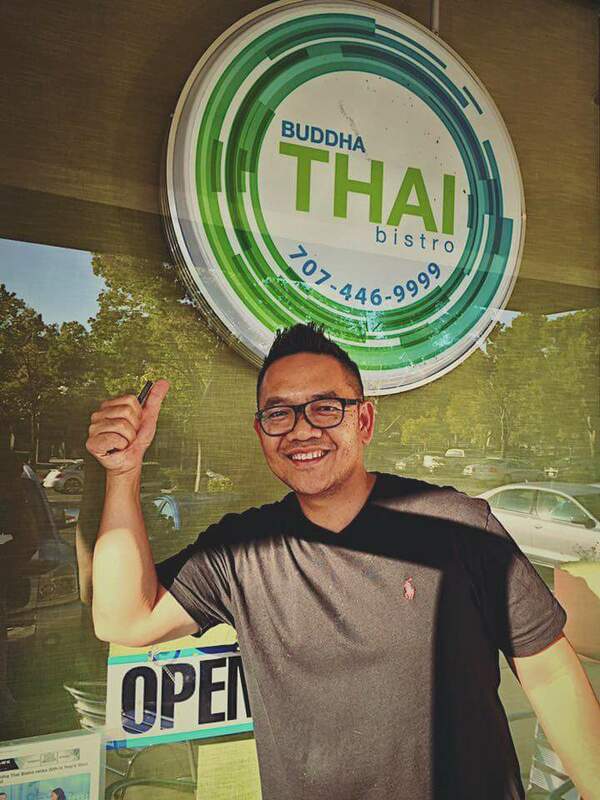 Big News from Andy: He will be opening a Thai fusion restaurant and wine bar in Vacaville in the next few weeks. It sounds amazing and I absolutely can’t wait to try it out and tell you all about it. They will have Thai small paired bites of food with curated wines as one of their offerings. How interesting will that be? I don’t think I have ever seen that with Thai food. Watch out for our upcoming article.